Students who attend The Ohio State University are often exposed to eye-opening, mind-opening, and heart-opening experiences. Grant McHugh, a third-year Construction Systems Management (CSM) major, is a prime example. As a native of Dublin and Marysville, Ohio, he grew up enjoying anything that involved the outdoors. Though he favors activities such as hunting, hiking, fishing, he does not mind just hanging around outside with his friends and family. But if Grant isn’t found being active outside, he’s probably listening to country music or jamming out on the guitar or one of the other many instruments he can play (bass, ukulele, and piano). Grant is also passionate about his religion and leads worship at his church. When he was young, construction work was just a mere thought in his mind. It was not until high school that Grant really began to see it as a potential career. It was a field that incorporated the outdoors with similar productive and industrious skills required in some of his favorite outdoor hobbies. And so, Grant chose to major in Construction Systems Management (CSM) at Ohio State. CSM students often have the opportunity to participate in many internships over the course of their studies. 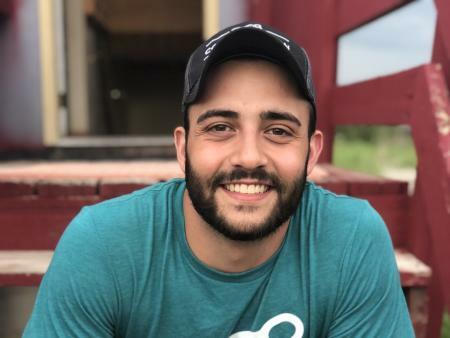 Grant gained a remarkable internship opportunity with Next Step Ministries, a Christian non-profit organization focused on construction projects and relational ministry. Through this work he was able to share his faith with others all while applying and putting his CSM knowledge to work. “Listening, understanding, and helping. That is what needs to be a part of our learning,” Grant says. For three months over this past summer, Grant lived on the Oglala Indian Reservation in Pine Ridge, South Dakota. Being one of the largest Native American reservations in America, Pine Ridge encounters alcoholism, drugs, abuse, and other devastating challenges within the community every day. Grant and other students who are passionate about helping others go to Pine Ridge not only to help build homes and infrastructure for the area but to build lasting relationships with the families and organizations in the community as well. Not everyone can say they are willing, and welcome, to live and work how Grant and his peers did for three months. Grant found that his biggest take away was not even about construction or his future career, but the experiences and valuable lessons he gathered along the way. “Learning about other cultures and witnessing how they engage with the same God I believe in is incredible. It’s refreshing and unique. The Lakota people taught me more than I can capture in a short little snippet, but my summer on the Pine Ridge Indian Reservation was one of the best experiences in my life,” Grant says. A surprising fact that Grant discovered was that the members of the Pine Ridge community are not all that different from Columbus’ residents. Although Pine Ridge may look a little different and have slightly different policies, laws, and practices from Columbus, scattered pockets of both wealth and poverty, severe addiction, homelessness, abuse, broken families, and other “grievous acts” can be found in both areas. Grant has come to learn that there is more to places than the negative stigma around them. He developed friendships and shared an experience with the people of Pine Ridge. Grant is passionate about volunteerism. He dedicates his time with the goal of community development and to do what is best for the community.